Following an extensive mid-term makeover Mercedes-Benz is preparing the groundwork for the introduction of their latest C-Class saloon, estate, coupé and cabriolet models. One of Mercedes-Benz’s great success stories, C-Class has recorded global sales of almost ten million units since it was originally launched, with close on half a million sold last year alone. Though it will be September, and possibly later, before Irish motorists get the chance to drive it, it is said that the upgrade made in terms of its design, specifications and technological advancement raises this latest C-Class range well beyond what customers might expect from a car in its segment. Visually enhanced, with redesigned front and rear bumpers, new front and rear lights, chrome highlighting, new silver and emerald green metallic colour additions and diamond pattern grille on AMG versions, its other key features include completely new electronic architecture and a new generation of four-cylinder petrol engines. 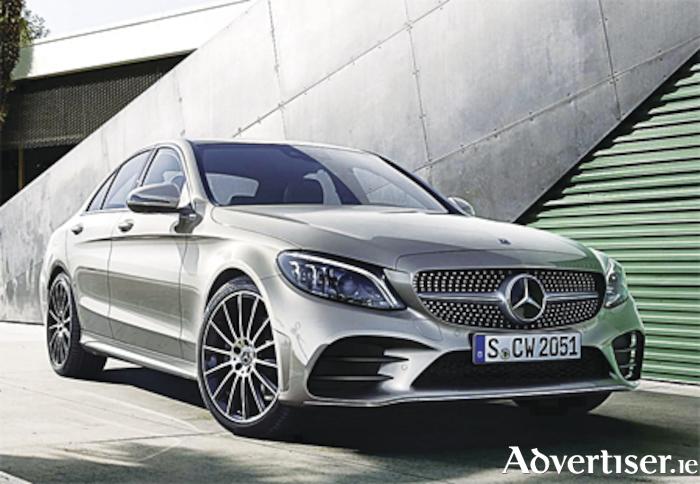 When here, it will be offered in three style and equipment lines – ‘Avantgarde’, ‘Exclusive’, and ‘AMG’. Other noteworthy items include a fully digital display and multimedia information system that can be configured according to personal preference. Included are two USB ports, an SD card reader, Bluetooth connection and media interface, geared to provide tailor-made information and in-car entertainment as well as latest-generation online and Mercedes-me app services. Its sporty interior is reflected in new trim and upholstery colours, walnut and anthracite oak veneering, a centre console finished with elegant flowing trim elements, and a new, improved multi-contour seat package, electrically driven via the multimedia system. A Keyless-Go start function and halogen headlamps with LED daytime running lights are standard across the range. In its use of digital technology, the new C-Class range keeps pace with other Mercedes-Benz newcomers with safety-focused driver assistance and infotainment systems managed by touch-sensitive steering wheel controls. Intelligent drive technology and safety items include semi-autonomous driving, improved camera operation, better road-ahead radar and surround-car viewing. Active distance control, lane change assist, emergency stop braking and steering assistance systems add to its line-up of active safety items. Optionally available are systems that improve night visibility. Amongst its innovative eco-friendly features is EQ Boost which helps reduce fuel consumption and deliver extra power when accelerating or when operating at low speeds. Arriving next year will be a plug-in diesel hybrid that combines a new generation diesel and a latest-generation nine speed hybrid transmission to deliver additional electric power, added torque, and an intended range of around 50kms on electric power alone. Other tech goodies include a control that contributes to driver relaxation and wellbeing by linking all of the comfort systems, an anti-theft alarm system that can record instances when parking damage is caused by another vehicle, and a futuristic ‘near field communications’ feature that allows owners to convert their mobiles into a vehicle key to control functions remotely. Contact Michael Moores Mercedes-Benz on (090 ) 6403000 for more details on the Mercedes range. Page generated in 0.0987 seconds.